Home » Posts tagged "blaster"
After all the classic Star Wars Blasters I have modeled, I decided to model one of the newest props to grace the silver screen. This time it is the blaster given to Rey by Han Solo in The Force Awakens. She puts it to good use outside Maz Kanata’s castle right before Kylo Ren captures her. Having just completed my revamped Return of the Jedi version, I decided to model the version of Boba Fett’s EE-3 Carbine rifle from The Empire Strikes Back. It was a little bit more difficult to model this version of the prop because many of the parts added to it by the prop builders are unidentified. Starting with the Webley & Scott No. 1 MKI flare pistol from the ROTJ model, I began by working on the barrel rings to which the scope rings and scope are mounted. What these parts are, isn’t exactly known on the prop were but the best guess are pool pump tubing clips combined with metal pipe clamps. The rear one has a metal clamp with a tightening screw at the bottom and the front one is more or less a curved strip of metal that fits inside the tubing clamp. The front ring is attached to the MPP Microflash flashgun body (that the prop maker slipped inside the barrel of the flare pistol) by two short bolts that poke through the inside of it through the holes of the rings. Nothing secured the bolts other than what appears to be some wire wrapped around the two bolts. I realized I forgot to add the wire detail to the model but I will fix that soon. The modeling was the simple part, finding good reference photos was the challenge. After recently reviewing my old 3D model of Boba Fett’s blaster, I discovered quite a few discrepancies in details and dimensions from the actual prop. I was initially concerned with bracket for the stock because, remembering from when I first modeled it, it was not quite right. In fact, the bracket was way off in its appearance. Then as I started working on the bracket and I discovered even more incorrectly dimensioned parts. Therefore, the best course of action was to start over from scratch. I could go over all the problems with the first model but there would be too many to list. The Blastech EE-3 Carbine rifle prop used by Boba Fett in Return of the Jedi, like the one in The Empire Strikes Back, started with a WWI Era Webley & Scott No. 1 MKI flare pistol. Various found parts were added onto it including a 4×20 riflescope. The ROTJ version of the prop is significantly different from the one in The Empire Strikes Back and most notably in the design of the gun barrel. The prop was much more refined as it was in several close-ups shots. 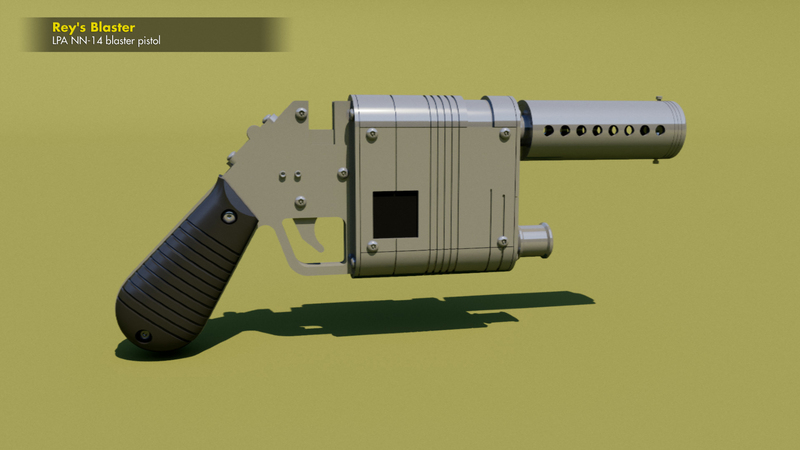 After my last starship project was finished, I thought I would do some small and I decided on modeling a version of Han Solo’s DL-44 blaster. There were quite a few versions of the prop used in the original Star Wars Trilogy but all were German Mauser C96 “Broomhandle” semi-automatic pistol based. I decided that I would model the version used by Han in the Bespin scenes of The Empire Strikes Back. While not as iconic as the “Greedo killer” version Han Solo uses in the Cantina scene in A New Hope; rather it is the one that he fired at Darth Vader before being disarmed. I plan to model the other versions in the future and thankfully the tough part (the Mauser) only needs modeling once because it will not change. The parts that turn the Mauser C96 pistol into The Empire Strikes Back Bespin version are a WWII era US Army M19 Tank/Artillery gun sight, a machined bracket for the sight, a knurled nut, a custom milled flash hider and various parts from the Revell 1:4 Visual V-8 engine model kit in addition to various screws. It has been a while since I participated in the Google SketchUp 3D Challenge as I have been spending much of my time modeling starships. But when the topic of Ray Gun came up I decided to “give it a shot.” So I decided to do a blaster from Star Wars… no surprise there. At first I was going to do Han Solo’s blaster from A. New Hope. After downloading some reference photos I decided it was much too complex for the time allotted. The Mouser handgun it is based on is highly detailed and just too complex for the amount of realism I try to put into my models in a short period of time. I finally settled on Boba Fett’s EE-3 Carbine Blaster Rifle from Return of the Jedi. It was much less complex overall. In the end it turns out I ran out of time to submit my entry because I had other priorities to work on. But I wanted to finish it so I kept working on it until it was done. This blaster was made from a 1916 British Webley & Scott No. 1 Mark I Flare Gun. Starting with the flare gun the prop makers added a PVC pipe and various other parts to give it a futuristic look to it. On either side of the gun’s breach they glued a bomb rack part from a F4E Phantom scale model to cover up the writing engraved there. To the stock of the gun they added a gear case from Revel Visible V8 engine model on both side. In addition to the engine part they also added an undisclosed plate cover to both sides of the stock. It was then painted and then distressed to show a lot of use. My virtual replica represents the blaster in “new” condition without any wear and tear. To give it the distressed appearance I would have to add textures to the model which would take much more time to do. Most of my models are without many textures because they take too much time, increase the file size and really don’t add much to the model. I decided to model the Webley flare gun first then went on to make the changes to “convert” it into the blaster much like the original prop builders. Thankfully there were enough photos of the flare gun online to study. If it wasn’t for so many fans building blasters from these old guns there might have been nothing to go on besides screen captures from the movie. It was difficult getting the curves in the handle and the stock bracket to match the actual gun and I got fairly close but I could make it better if I had the time to do it during the challenge. Had I known I was going to run out of time to finish by the deadline I would have spent more time getting the curves right. I duplicated the finished uncolored flare gun and moved it over so I could later show a comparison of the Webley to the blaster. Once I was done modeling the Webley flare gun I then started modeling the new barrel. That was no big deal. I moved on to the scope. The scope was pretty straight forward except until I got to the adjustment knobs on top. They are supposed to have a cross-hatched texture for gripping on them which would be easy enough to do with a textured graphic but I did it with actual module geometry. It was more time consuming than difficult. Modeling fine details like that in SketchUp is nearly impossible unless you know a trick or two. When working in a micro scale the program has a bad habit of randomly omitting faces leaving holes in shapes. To get around this I take the shape I am working on and scale it up to 10 times the intended size and when I am done I resize it back down to the correct size. Doing that also prevents the need to deal in 1/128th of an inch increments when going that small. The final modeling work was on the rest of the details the prop makers added to the blaster. After that I added color to the model. I colored the original flare gun to match one version of it in a photo. Apparently the flare guns were made in a variety of metal finishes and this one happened to have a brass handle with everything else the typical gun metal grey. For the blaster I chose a slightly reddish black and gave all the screws a rusty brown color. I created scenes to show off both finished guns. Even though I didn’t finish in time for the challenge I enjoyed finishing the model. Maybe I‘ll go and finish the Stormtrooper blaster for the Rifle challenge I failed to finish. I will see about that.